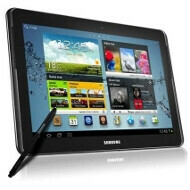 J&R, Adorama, and a few other retailers started carrying the Samsung Galaxy Note 10.1 tablet again for preorder, after the company said it was listed on Amazon by mistake not long ago. The price hovers around $500 for the 16GB model, and $50 more gets you the 32GB version. This puts it up against the new iPad directly, but Samsung has some tricks up its sleeve to battle the Resolutionary display of Apple's finest. First off, the Galaxy Note 10.1 is powered by a quad-core Exynos processor, and the PLS-LCD screen might be with a 2011 tablet screen pixel density, but you can doodle on it with the S-Pen technology, and the apps that take advantage of it are only getting more and better.